ww2dbaseBertram Home Ramsay was born in London, England, United Kingdom into a Scottish family. He attended the Colchester Royal Grammar School and joined the Royal Navy in 1898. He served aboard HMS Britannia and HMS Crescent before participating in WW1. In Aug 1915, he received his first command, M 25, a monitor. In Oct 1917, he became the commanding officer of destroyer Broke, with which ship he participated in the Second Ostend Raid on 9 May 1918. 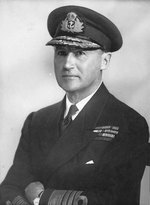 He remained in the Royal Navy through the inter-war years and resigned in 1938.
ww2dbaseAs the threat of the European War loomed, Ramsay returned to the Royal Navy at the rank of vice admiral. On 24 Aug 1939, he was placed in charge of the Dover, England area of operations. In 1940, he was placed in charge of the evacuation of British Expeditionary Force troops and French troops from Dunkirk, France, code named Operation Dynamo. He planned and executed the evacuation at a high level from his underground headquarters beneath Dover Castle. For the success of the evacuation, he was awarded the Knight Commander of the Order of Bath after personally reporting the operation to King George VI. Between 1940 and 1942, he continued to oversee the Dover area operations, largely involving the defense of the waters nearby from German attacks. On 29 Apr 1942, he was named the Naval Force Commander for the invasion of Europe; although the invasion of Europe was postponed, his assignment transferred to an equivalent position, that of deputy naval commander of the invasion of North Africa in charge of amphibious landing operations. He operated in a similar role during Operation Husky, the invasion of Sicily, Italy, in Jul 1943. In 1944, he was named the Naval Commander in Chief of the Allied Naval Expeditionary Force, and oversaw Operation Neptune, which was the naval portion of the invasion of Normandy, France in Jun 1944.
ww2dbaseIn Jan 1945, Ramsay was killed his aircraft crashed on take off at Toussus-le-Noble, France. 20 Jan 1883 Bertram Ramsay was born. 2 Jan 1945 Admiral Sir Bertram Ramsay, the mastermind behind the evacuation of Dunkirk in 1940 and now in charge of Allied ports in France, was killed when his aircraft crashes on take-off at Toussus-le-Noble, becoming the fourth senior Allied leader to die in a plane crash. He was en route to a conference with General Bernard Montgomery in Brussels, Belgium. My Dad, now 95, says he travelled with American troops on HMS Britannia of Liverpool in December,1942 from New York City area to Liverpool. I have been unable to find this ship and any information. It was among a convoy of many other ships. My dad was Admiral Bertram Ramsy's chauffeur on that fateful day. As he watched his plane taking off, it blew up as if a bomb had gone off inside it. He had kept a large photo of him in a beautiful leather folder. He would show it to us when we were children but would always say the crash looked like sabotage not an accident.